Dr. Tomas Rawlings is Design Director at the indie games studio Auroch Digital. As well as running the studio, he is an experienced, award winning games designer who has created games from original titles to well-loved IP such as Games Workshop’s Chainsaw Warrior, Star Wars:The Battle for Hoth and the multiple award winning Call of Cthulhu:The Wasted Land. 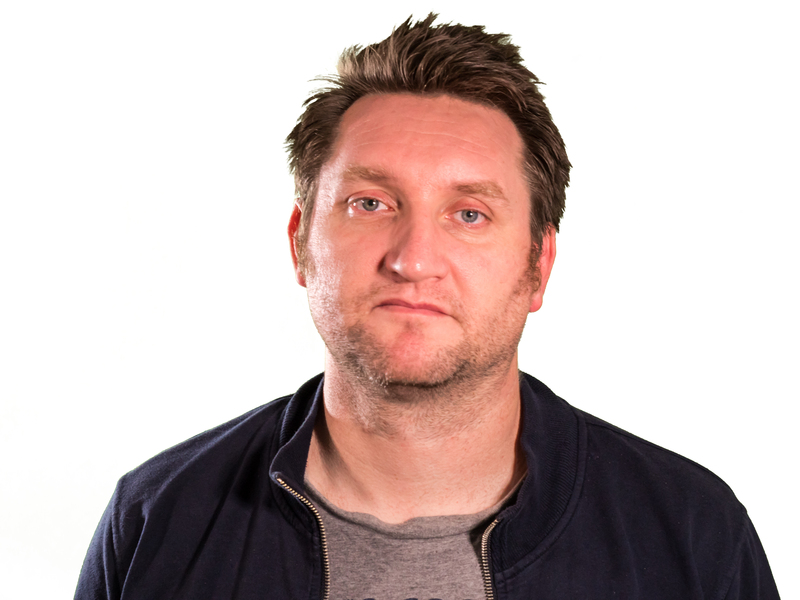 He is a well known speaker and consultant on games and gaming who has also worked with major organisations such as the Wellcome Trust, the Royal Society, UK Parliament and the BBC. He also created and ran Auroch Digital’s acclaimed news-gaming initiative GameTheNews.net which produced the global talking-point, Endgame:Syria. He has a doctorate from the University of the West of England in Software Studies. He also blogs at agreatbecoming.com, is a co-founder of the non-profit Bristol Games Hub and was named in Bristol’s Arts & Culture Power List. I currently run games consultancy & development studio, Auroch Digital – where we do development, consultancy, research and production among other creative activities. We do a lot of games/science and real-world gaming simulations. We also specialists in physical/boardgames into digital and mobile into PC. We work with Games Workshop, Steve Jackson Games and many more! Examples of consultancy clients include The Wellcome Trust and the BBC. I’m also part of an indie development project, Red Wasp Design where we released a well received 3D turn-based strategy game for iOS and PC based on the works of H.P.Lovecraft and the award winning RPG Call of Cthulhu, called ‘Call of Cthulhu: The Wasted Land‘. I’m based at Bristol Games Hub, Bristol, UK – where we make games, chat and run Game Jams as well as a monthly group for the local game development community. Prior to all this, I worked for Cardiff City Council as an assistant psychologist and residential social worker in the mid to late 1990’s when I decided to go with my earlier inclinations (a love of games) and moved to working as a computer games designer for Hothouse Creations and Pivotal Games for PC, Dreamcast, PlayStation2 and Xbox. I have also worked as an associate lecturer at Bridgwater College and University of West of England (UWE) on matters of media and technology and computer games. I am the co-author of the first ever book on filmmaking and the Internet: PlugIn&TurnOn: A Guide to Filmmaking for the Internet, published by Marion Boyars Publishers (May 2004). 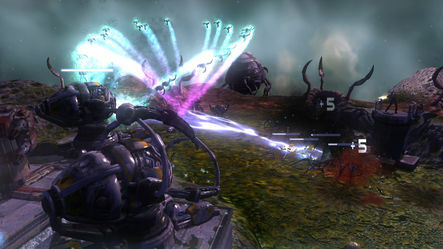 I was the co-founder and Development Director of FluffyLogic, a digital media studio in Bristol that has made a number of well-received and profitable games, from September 2004 until September 2010. I completed by PhD examining evolutionary theory and networked forms of media at UWE in July 2013. I’m interested in evolution, science and reason, but I look forward to the day when the great Cthulhu awakes and ushers in the end times. Ai! Ai! Cthulhu Ph’Tagen. Ph’nglui mglw’nafh Cthulhu Rl’yeh wgah’nagl fhtagn! I’m on twitter at: @TomasRawlings. Feel free to say hello! I’m on LinkedIn too. If we’ve connected, let’s link too! My YouTube account is here. Auroch’s is here. I’m told web video killed the radio star. Achtung! Cthulhu Tactics – (PC, Xbox One, PS4 & Switch) – A Lovecraftian take on WW2 combat as the Nazis ally with an older, darker power and you need to stop them! Ogre (Steam/PC) – The classic strategy game by Steve Jackson brought into the digital age. Last Days of Old Earth (Steam/PC) – A deep strategy game with publisher Slitherine set at the end of time. Elections of US America (Card game) – A crowdfunded physical newsgame in conjunction with US political site Wonkette. Ballot Bots (HTML5) – A game with BBC Newsbeat for the UK Election in 2015. Chainsaw Warrior: Lords of the Night (Steam/PC, Mac, Linux) – Sequel to the Games Workshop classic, Chainsaw Warrior. Darkness is back! 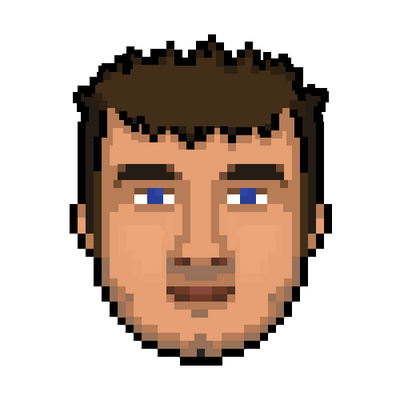 Fire the the Booth (HTML5) – Developed for BBC Radio 1xtra, a fun rap battle game featuring pixel version of their DJs! Plague Inc: Evolved (Steam/PC/Mac/Linux) – Auroch Digital has been working with Ndemic Creations to help make Plague Inc. on desktop a reality. Chainsaw Warrior (Steam PC/Mac/Linux, iOS and Android) – A digital version of the classic 1987 Games Workshop published board game. “Perfectly judged, brutally demanding and almost impossible to put down…” The Guardian. GameTheNews (HTML5/Mobile) – A project making games from news! Including the global-talking point that is Endgame:Syria and NarcoGuerra. Gamify Your PhD (HTML5/Browser) – A suite of 4 mini-games gamifying famous science experiments and explaining the principles of game design. I was the external producer on this title. Call of Cthulhu: The Wasted Land (iOS, Android, PC/Steam) – Game based on the cult writer H.P. Lovecraft and also on the paper RPG ‘Call of Cthulhu’ which has got some great reviews and was no.1 in the UK RPG category of the App Store. It also passed though Steam Greenlight into the Steam Store. Cthulhu Christmas Calendar (iOS, Android) – Red Wasp Design’s first title. “Red Wasp has produced perhaps the most interesting iPad advent calendar ever.” DigitallyDownloaded.net. Mirrornaut (Browser) – Developed for a GamesJam – it won an award at the jam and got picked up by the indie press. Bag It & Bin It (iOS) – A game for Wessex Water to help people have fun and learn how to save water and dispose of waste correctly. I was the designer on this project. Eat Them! (Playstation3) – Another PSN title for Sony – Monster-smashing action game. I was the Development Director during most of this title’s development period, so getting involved in design, testing and fan and press outreach. Here’s a review. 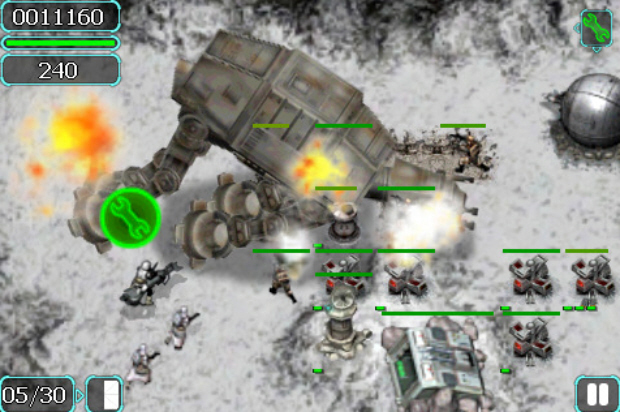 Star Wars: The Battle for Hoth (iPhone, WM7 and iPad) – Lead Designer, community support and media campaign. The game hit number 6 in the US paid App charts, twice! Savage Moon: The Hera Campaign (PSP) – Also Lead Designer on this title and did the follow-up community support and media campaign. Two By Two – My first iOS title! A fun casual puzzle game. Hidden Danger UXB! (iPaq) – A GPS game for Hewlett Packard’s Mscapes platform. I was Lead Designer on this title which included an online user-generated content system. The Dark Mirror (Paper RPG supplement) – Developed and wrote this add-on for the Call of Cthulthu RPG game which sees the players as the cultists rather than those trying to stop them. Conflict: Vietnam (PC, Platstation2, xbox) – Level design and scripting, script-writing and testing. Conflict: Desert Storm II (PC, Playstation2, xbox, Gamecube) – Testing and gameplay evaluation. The Great Escape (PC, Platstation2, xbox) – Based on the 1963 film, I was Lead Designer on this title. It charted in the UK at no.2 (below Eye Toy). Conflict: Desert Storm (PC, Playstation2, xbox, Gamecube) – Testing, gameplay evaluation and multiplayer lobby design. First title in the million ‘Conflict’ selling series of action/tactical shooters. Abomination: The Nemesis Project (PC) – Level design, testing, interface and other design tasks. Gamesindustry.biz: From Paper to Digital: The Cthulhu Strategy of Games Development, Store Wars: Which is the right app store for you?, Gary Gygax: The Father of Games Design, How We Evolve Fun. Wellcome Trust Blog – Deus Ex, the Scientific State of Mind, Crysis & the Biological Singularity & On the Brink of climate change, What World War I and medical history brought to our game. Gamezebo.com: How to Start a Games Development Studio – Parts 1,2 & 3, The Future of Consoles. The Independent: The world’s best video diarists, Open source websites: All change on the internet, New Media: Who are the real winners now we’ve all gone Wiki-crazy? PlugIn&TurnOn: A Guide to Filmmaking for the Internet. Published by Marion Boyars Publishers (May 2004). My blog title comes from a line in the 1986 film Manhunter; “I am the Dragon. And you call me insane. You are privy to a great becoming, but you recognize nothing. To me, you are a slug in the sun. You are an ant in the afterbirth. It is your nature to do one thing correctly. Before me, you rightly tremble. But, fear is not what you owe me. You owe me awe.” (Sampled in this great track). Why this? (It’s not that I’m a mentalist, honest!) I think that what we are witnessing with the rapid changes in technology all around us is a great becoming and yet we are so close to it that we often fail to recognise what is happening around us until the change is already the past. I am also a fan of the cool 80s style of the film. Manhunter also features the work of William Blake whose art is worn by the character (as a tattoo) that speaks the above quote. In addition, I’m a fan of the director, Michael Mann and so that snippit of the quote became my blog title. I’ve got some older game design documents on Scribd here. In terms of big companies and organisations; you can see who we work with at Auroch Digital here (we have also been invested in). I’m also a co-director of Bristol Games Hub (a non-profit). I have a (very) small amount of personal money invested in the Triodos Bank. Other than Auroch Digital Ltd & Bos Taurus Diceworks, I have no other shares or direct financial interests in any games companies or games media outlets.